This was a special pizza. My brother-in-law, Matt, gave me a cast iron skillet for my birthday. I have been a little too intimidated to try using it myself so he offered to come do a cast iron deep dish pizza lesson. It was super easy to make and so much more delicious than my old method. The cast iron skillet cooks the dough to perfection, crispy on the outside, soft but not mushy on the inside. The cheese melted beautifully and stretched out into long strings. The ingredients tasted much more flavorful. Andrew and I agreed that we will be making many more cast iron deep dish pizzas in the future. Note: The pizza was cooked on the grill. I don’t eat radishes often because they’re not my favorite veggie, but they tasted great on this pizza. 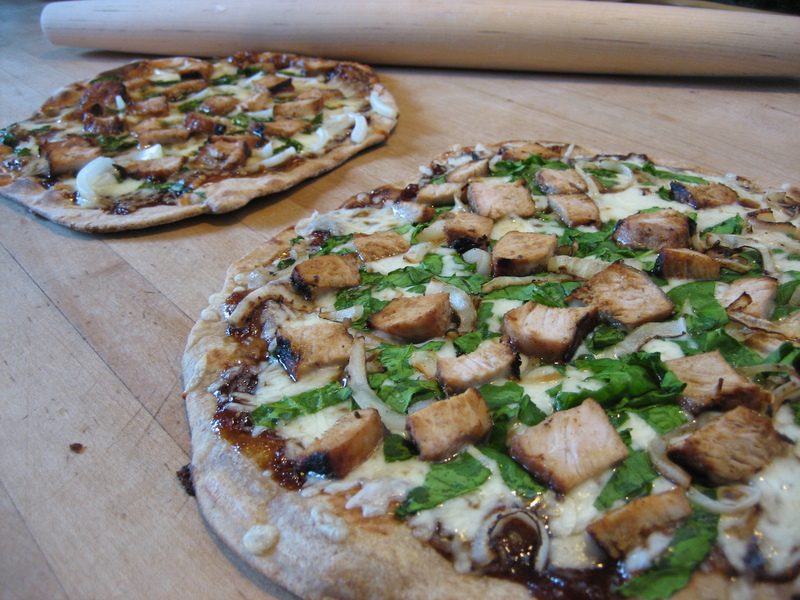 In addition to grilling the toppings, both pizzas were cooked on the grill. 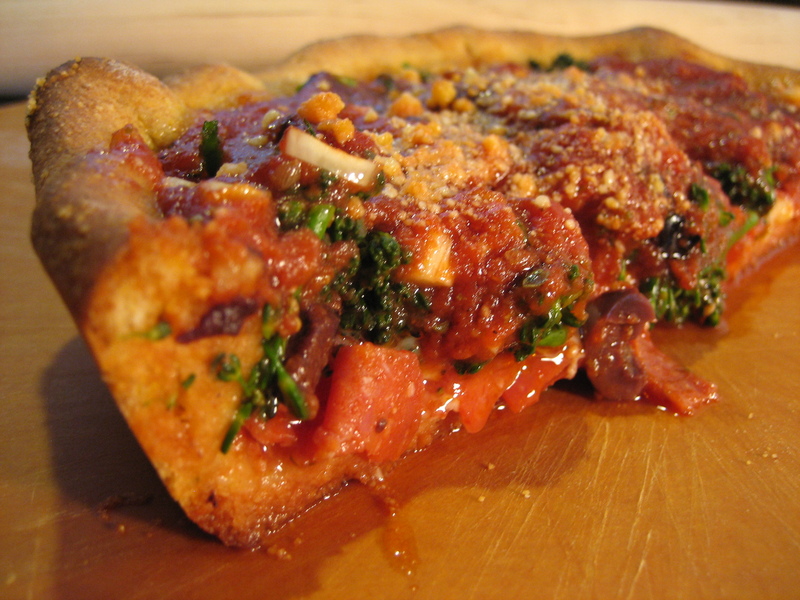 The ingredients I used for this deep dish pizza are some of my all time favorite. I thoroughly enjoyed this recipe and will definitely repeat it in the future. I rolled out, then pressed deep dish pizza dough (1 cup cornmeal substituted for 1 cup flour) into a round pie pan that had been sprayed with canola oil and sprinkled with cornmeal. Pre-baking the dough takes about 7 minutes since it is pretty thick. 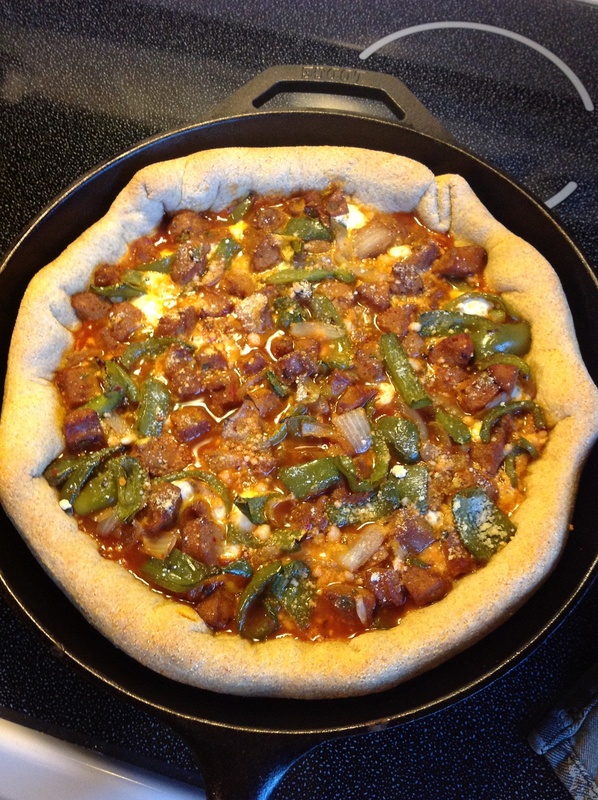 After pre-baking, I layered mozzarella cheese, Italian sausage, green peppers, onions and pizza sauce in the pan. The thickness of the pizza causes the it to take longer to bake, so I baked it for about 20 minutes. You can use your regular pizza dough recipe to make the dough. 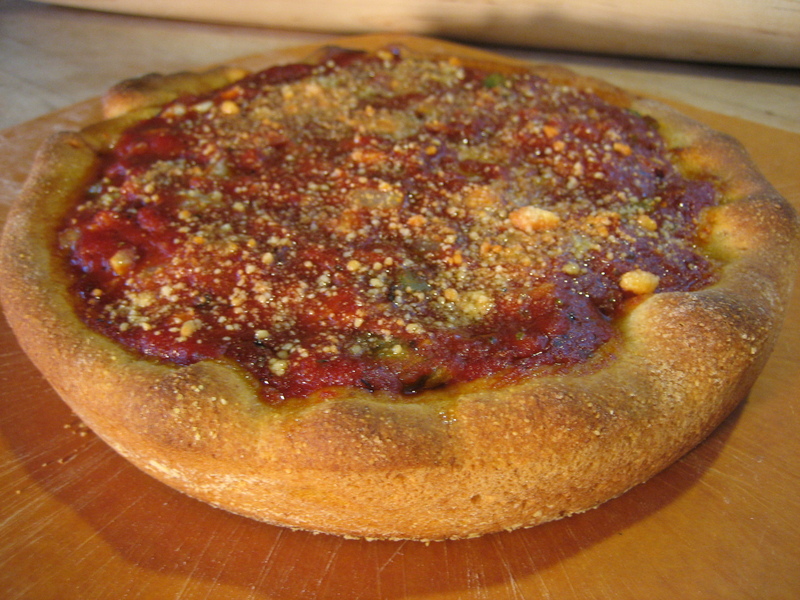 I substitute one cup flour with 1 cup cornmeal for my deep dish pizza and it works great! Bok Choy is Chinese cabbage widely used in Asian cuisine. The green leaf vegetable is high in vitamin A and C and best of all, it holds up well under the high temperatures required for baking pizza. Andrew’s little brother came over for this pizza. His favorite pizzas have been my Garbage Plate pizza, pulled pork pizza, and spicy meat pizza, so it was funny to see him devour a bok choy pizza with grilled chicken. It must have been good because there weren’t any leftovers! My first attempt at Chicken Cordon Bleu pizza tasted fine, but it lacked the flavor I was looking for. 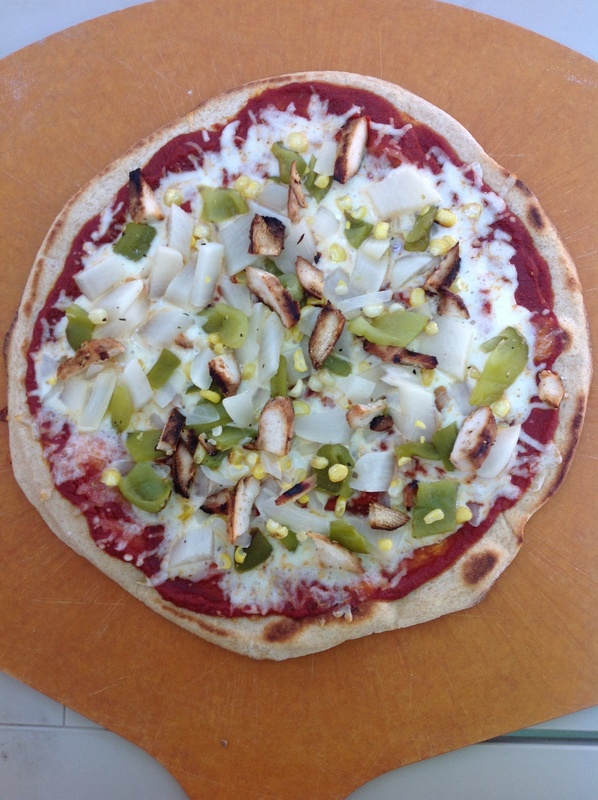 After two years of turning my favorite dishes into pizzas I have had a lot of practice creating flavorful sauces and the creamy parmesan sauce I made for this pizza made all the difference. It had great, rich flavor, but it wasn’t over powering. First, I cut chicken cutlets into small pieces, dipped into flour, egg, Parmesan cheese and breadcrumb mixture, then baked it until golden brown. This got a little tedious so next time I will bread and bake the chicken cutlets whole and then cut after baking. While that baked I made the sauce. I melted butter, added flour, minced shallot, milk, Parmesan cheese, shredded Swiss cheese, and Riesling. 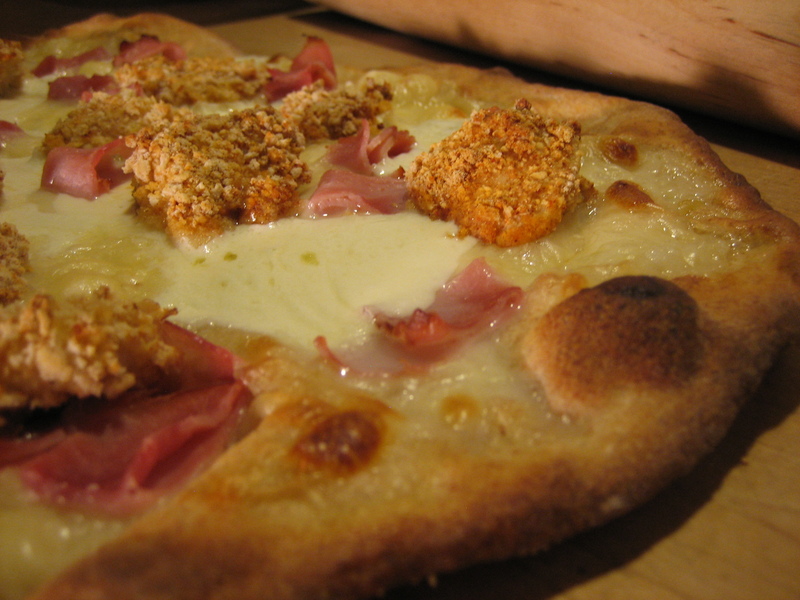 After the sauce became thick and creamy I spread it on pre-baked crust, added Swiss and fresh mozzarella cheeses, then topped it with the breaded chicken and sliced ham. I let it bake at 500 degrees for about 8 minutes.